Most of us have space issues in our kitchen because of the increasing number of gadgets we buy. Therefore, we probably also have more gadgets than power points as well! To minimize gadget clutter and keep as many of them out on our countertops and always plugged in, it’s handy to have a few dual purpose appliances. Not only do they save space in the kitchen, but they can also save you a bit of money. The best coffee maker with hot water dispenser can not only make coffee for everyone in the family but also dispense hot water separately to use for your instant oatmeal, soups, hot cocoa, etc. No need for a separate kettle! Before you buy, first determine if you need one that’s very versatile in terms of choosing between a single cup or a carafe of coffee because one that can do both will cost you more. Some models are more efficient it letting you use only the dispenser part without the need to have the brewer on at all. We think any of the following coffee makers with hot water dispenser are good buys, but if you need to do your own search, Amazon has quite a few more! While all of the ones below make good coffee, they’re not the best at it, so you may want to take a look at drip coffee makers or pod coffee makers that don’t include a water dispenser but are the absolute best at just making great tasting coffee. Of course, if you take that route you’ll also need either an electric kettle or a stovetop kettle to boil water. 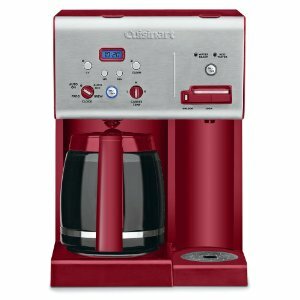 If you like the K-Cup idea and want a very versatile brewer with a large built-in water reservoir, the Cuisinart SS-700 Single Serve Brewing System might be right for you. This fully programmable single serve coffee maker with hot water dispenser lets you set the time of day when you want some fresh brewed coffee or you can set it to turn off at a certain time, and it even lets you select the size of the cup, from 6 ounces, 8 ounces, 10 ounces or 12 ounces, plus a travel mug size. Just fill up the included reusable K-Cup with your favorite coffee blend or select a pre-packaged K-cup (you’ll get 12 as a starter pack), put it into the machine, select your preferred brewing temperature, and let the SS-700 do all the work. After each cycle, the brewer will automatically get ready for the next cycle, including heating the water. If you only want hot water for your morning oatmeal or evening soup, the hot water dispenser works well and cup sizes can also be selected along with it. If you’re switching between coffee and tea or cocoa or just hot water, you can use the rinse button to clean out the shower head first. With an 80 ounce reservoir, you’ll be able to make several cups of coffee, or iced beverages, without having to refill. Plus, the reservoir is see-thru, so you’ll always be able to know how much water is available and if you need to add more. To make it even easier, an LED indicator will flash a “low water level” alert too. You can then take the reservoir to the sink to refill or pour directly from a jug or bottle. You’ll also get a charcoal water filter that will get rid of the impurities in your tap water before it gets brewed. That’s a nice touch, and you’ll never have to use distilled water again. Best of all, Cuisinart offers a limited 3 year warranty on this unit, which speaks of its durability for the long haul. You are not limited to using only one brand of k-cups, and if you prefer to grind and brew fresh beans or use a boutique brand, you can do that too. So you get a lot of variety with this machine and is well worth the price. Both the Cuisinart CHW-12 and the CHW-14 Coffee Plus coffee makers are the same basic coffee making machines that come with a conical #4 reusable coffee filter for your own ground coffee. They both have hot water reservoirs, that you can easily fill and operate independently from the coffee brewer, which makes them great for the mug of hot chocolate, that bowl of soup or that cup of tea even if someone else in the family wants their coffee at the same time. You will essentially have hot water available whenever you need it. You can keep the machine on so that you can get a cup of coffee or hot water instantly whenever you want or manually switch it off or on. When manually switched on, this dual coffee maker and hot water dispenser takes about 3 minutes for the water to be at the right temperature. The hot water dispenser side cannot be programmed to start at a set time but the coffee brewer side can. There is a safety lever under the water dispenser outlet, so there’s no risk that children can play with it when no one’s looking. Unlike the Single Serve brewer above, you cannot set the temperature of the water, but customers say that the water temperature is just right for both coffee brewing and hot water alone. Of course, if you only want the hot water for drinking, you may have to wait a few minutes to let it cool down a bit. The 14-cup machine has a 56 ounce reservoir, while the 12-cup one is 54 ounces. They are both programmable for only 1 to 4 cups of coffee if you don’t want to brew a full pot, and they are both self-cleaning units. The reservoirs are not removable so you have to fill them using a jug or bottle. The other differences are these. The Cuisinart CHW-12 comes with a glass carafe and the CHW-14 comes with a thermal carafe. The glass carafe is kept warm on a heated base, and you can set the temperature from low, medium or high. This will always keep your coffee at the precise temperature that you want it. However, it also uses more electricity to do this with and the SCAA recommends that you don’t continuously heat brewed coffee, as that alters the flavor. On the other hand, the thermal carafe needs no supporting heated base, and it will keep the coffee hot for hours on its own. Of course, it will eventually cool down, but generally you’ll have hot coffee while you are drinking it until the thermal carafe is empty. Yes, this set up will save a bit of energy in the long run, but you’ll also pay a bit more for the thermal carafe. They are both terrific at what they do, and if you like a glass carafe, go with the less expensive CHW-12. If you like a thermal carafe and a bit of energy savings along with a slightly bigger capacity, then choose the CHW-14. But in all other respects, they are equal in every way. Mr Coffee is one of the most well known brands of drip coffee makers, and the Mr Coffee 12 Cup Programmable with the hot water dispenser, keeps the brand name at the forefront of quality coffee. If the Cuisinart brewers above are over your budget, then this machine should fit your needs just fine. You can brew as much coffee as you’d like up to 12 cups, and the programmable feature means you can set it to brew at any specific time, like say early morning, so that you’ll always wake up to fresh coffee. There are two water reservoirs – one for coffee brewing and the other 16 oz one for hot water. There is a pause feature, so you can get a cup of coffee in the middle of the cycle and before the carafe is filled, and you can even adjust the strength of the brew for a more robust flavor. The glass carafe is kept warm by the heating plate underneath, but a freshness timer lets you know how long it’s been since the coffee was brewed. The unit will also automatically shut off after 2 hours. The dispenser will give you hot water in about 4 minutes, and it will keep it hot whenever you need it for such things as tea, hot cereals, cocoa and anything else. Be aware that although it will accommodate most sized mugs and even breakfast bowls, it is a bit too short for a tall travel mug. The glass coffee carafe sits on a heated base that always keeps your coffee piping hot. This machine does not come with a coffee filter so you have to get either a permanent basket-shaped filter or paper filters. If you use large size 12 cup generic filters, always check the front lip to make sure the filter doesn’t get caught when you are closing the grounds container, to ensure the filter doesn’t fold over and cover the grounds. This is one of the lower priced coffee makers with a hot water reservoir, but it’s a good choice if you’re not all that finicky about . Although this is one of the most expensive coffee makers on this list, Keurig invented the pod coffee K-Cup idea, and if you like the convenience and are into the original, then the Keurig K450 2.0 Brewing System might be the next pod brewer on your counter. You can choose to make a single cup or a carafe of 4-cup capacity that is included with this unit. You can also select the size of a cup of coffee. This new Keurig 2.0 technology allows you to insert a K-cup or K-carafe pod into the holder, so it reads the lid and automatically determines the amount of water needed depending on the brew strength you select. When you purchase the K450 you also get a water filter cartridge and 6 K-Cup pods, 4 K-Carafe pods. With a 70 ounce water reservoir, you’ll have enough water available for many cups of coffee. It features a color touch display and it’s fully programmable to auto start and to only dispense hot water for other hot drinks like chais tea or hot chocolate. This pod brewer with water dispenser is made to use only the new Keurig 2.0 K-Cups, so you can’t use generic reusable K-Cup pods unless you try a workaround that existing users say works. However, as with all Keurig K-Cup coffee systems, this one comes with a 1 year warranty, but the warranty is void if you do not use anything except genuine K-Cup coffee pods. It shouldn’t be too much of a problem sticking to Keurig 2.0 pods though, as they include about 60 brands with over 400 varieties! ← What is the Best Tea Kettle for a Gas Stove?